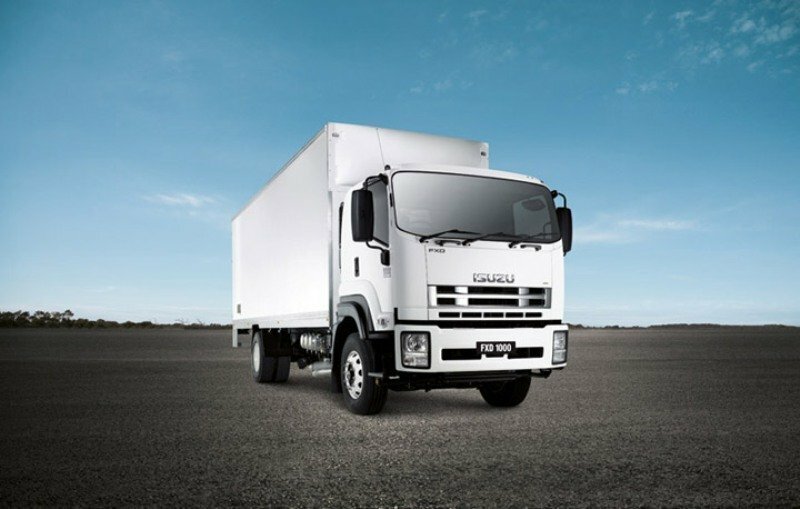 The Isuzu F Series lineup consists of more than 18 models with GVM (gross vehicle masses) ranging from 3559 kg to 24000 kg and GCM (gross combination masses) from 3550 kg to 42500 kg. The Isuzu FX Series is the biggest model in the F Series Range and occupies the gap between the F Series and Gigamax models, being available with GVMs ratings between 16500 kg-24.000 kg. The Isuzu FX series is equipped with a common rail diesel engine with a maximum output of 360 hp and 1442 Nm of torque. 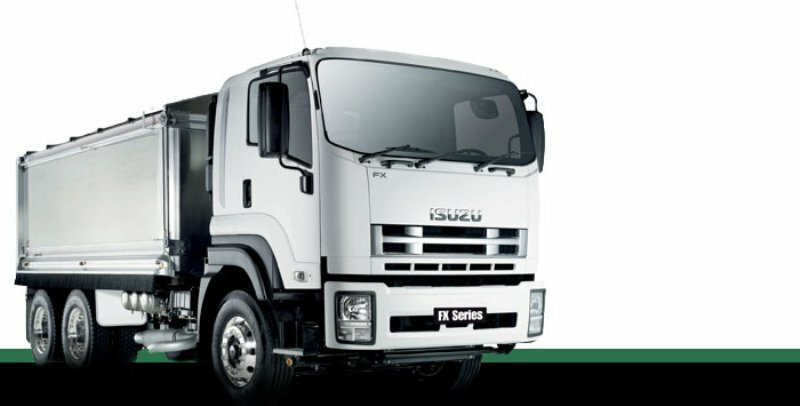 All Isuzu F Series models feature a cab forward configuration which was choose for its superior maneuverability. The Isuzu FX Series shares the same cab with its smaller F series sibling, but it received a few exterior modifications which betray is stronger character. The FX Series looks a bit more robust with a more imposing stance, enhanced by its higher rear ground clearance of 260 mm and the aggressive bumper. The Vertical front end received a pretty simple grille with a few shiny details to make it look more appealing to the eye. We can’t say it’s our favorite design in the segment, but it’s not that bad either, as it’s a good match for the utilitarian character of the truck. The bumper doesn’t have any modern design lines and apart from its twin air intake and the strong build quality it hasn’t anything to stand out from the crowd. Unlike the F series, which had the headlights mounted on both sides of the grille, the FX’s units are mounted lower into the bumper. Given the fact that the FX has a higher ground clearance a lower position for the front lights offers a better road visibility during the night. Both the F and FX Series share the same interior design with similar dimensions and layouts. Due to the high ground clearance, access inside is a bit difficult, especially because the first step is a bit too high and you’ll have to put in some serious efforts to be able to climb all the way up into the cabin. Luckily, the truck features wide doors opening to 90 degrees and large grab-handles which will make your life a bit easier. The Isuzu’s cab isn’t our first choice when it comes to design and comfort, as it’s a bit dated compared to other trucks in the segment. The plastics are also cheaper than what you’ll usually find in this class, but the fittings look well done and the overall build quality looks lasting. We find the controls and switches well placed and within easy reach. 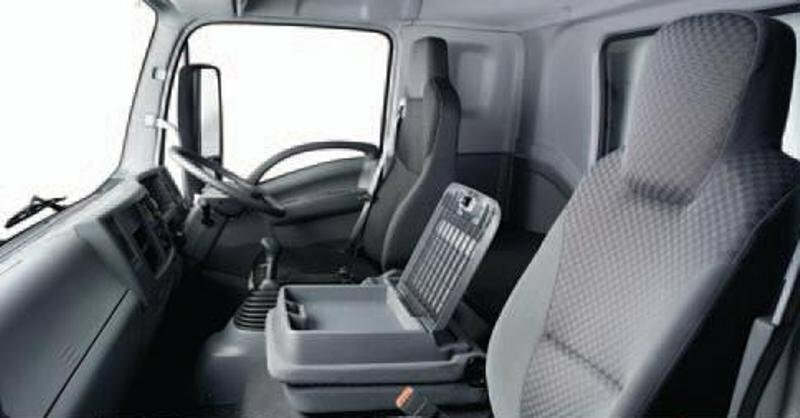 The F Series cab is also pretty roomy and practical with a nice interior lightening designed to limit Driver’s fatigue. The Isuzu FX Series is available with company’s touch screen audio-visual system which gives you integrated sat-nav, memory card slot for music or mapping, MP3 input, Bluetooth and optional external cameras. There is also worth to be mentioned that the FX Series cab is fitted with standard power windows with convenient switches mounted on the door panels. There is nothing wrong with the central instrument cluster either and its big gauges can be read effortless even during night journeys. Above the two main gauges there is mounted a separate multi-information display which keeps you posted on fuel consumption, speed warnings, engine hours, service intervals and other. The truck is also fitted with standard driver air-suspension seat. It comes with a huge number of adjustments and offers a pretty comfortable driving position. The seats also features an integrated three-point seatbelt, adjustable vertical shock-absorber, integrated pneumatic system, integrated heat restraint, dual-stage air lumbar with lateral support, and body-contoured upholstery from head to knee. The high driving position gives you a good all round visibility which is enhanced by the big windshield and the big heated mirrors with integrated spotter and kerbside spotter. Moreover, there are also available three optional cameras which can be operated through the touch screen system. You won’t complain about the storage places either, as the cabin is equipped with a plethora of cup holders, consoles and cubby holes to keep your things stored safely. The Isuzu FX range is powered by a 9.8-litre common-rail turbo-intercooled engine with a maximum output of 360hp @2000rpm and a peak torque of 1422Nm achieved at 1400rpm. The engine is combined with a standard exhaust gas recirculation (EGR) unit which offers lower exhaust emissions and enhanced efficiency. The engine is more than capable of dealing with heavy payloads effortless and can also attack sloped road sections with poise even when the truck is fully loaded. The engine is also pretty efficient, light and compact and complies with the latest Euro V emissions Standards. The Isuzu FX’s engine is mated on a 9-speed manual gearbox. The transmission was designed as an 8-forward speed unit and also incorporates a ‘crawler’ gear for difficult terrains when a better grip is needed. The truck if equipped with a standard 400 litre fuel tank, which provides adequate range for medium-haul applications. 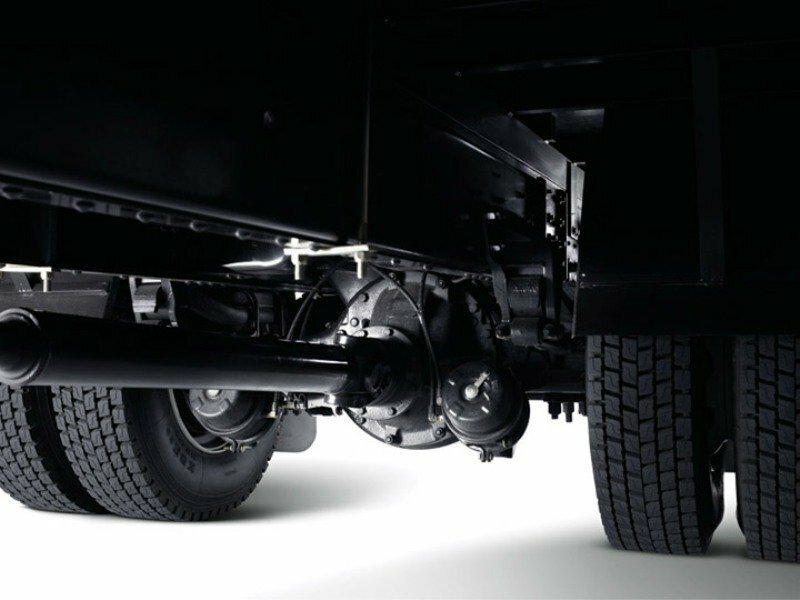 The ride quality is assured by a Hendrickson air suspension which is standard for all FX trucks. Thanks to the capable air suspension and the comfy jump seats, the ride quality is pretty good and the truck absorbs most of the bumps without transferring any major vibrations into the cabin. The vehicle is also pretty well balanced and despite its relatively tall stance it has a controlled body roll and good road manners. We don’t have any major complains about the maneuverability either as the cab forward configuration and the power steering offer an adequate handling which is at par with competition. The Isuzu FX Series is also pretty well represented in the safety department being available with a standard driver air bag, Anti-skid Regulator, Hill Start Aid and a full-air ABS braking system. Additional stopping power comes from the standard engine brake which spares the life of the service brakes and is very useful when dealing with downhill sections. Isuzu’s front axle is rated at 7500kg while the rear axle capacity exceeds the permissible rating of 9t on a single axle and 18t on a double drive unit. Isuzu made a good job with its FX Series, as the truck is very appreciated thanks to its efficiency and reliability. 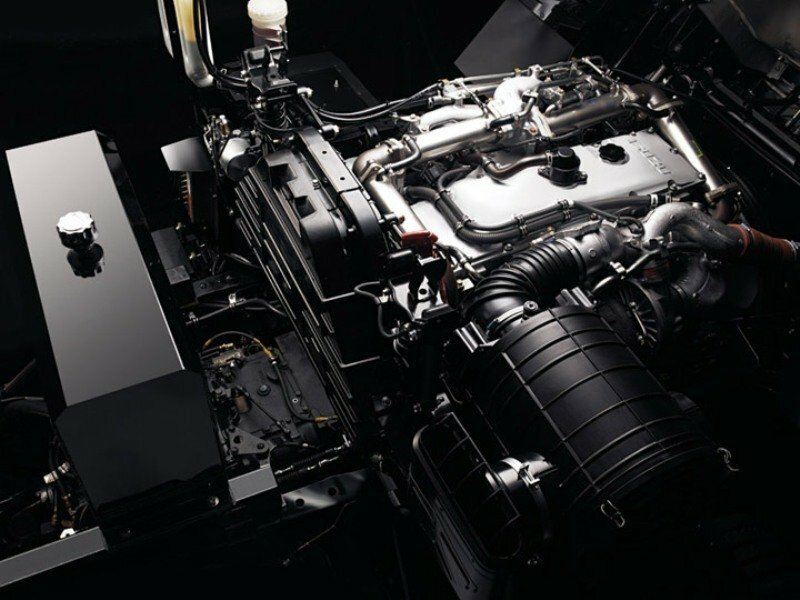 The engine is also pretty strong and up to its arduous tasks, but we would’ve prefer more power options as other trucks in the segment offer a wider range of outputs. The ride and handling are at par with competition and the payload capacities are also fairly generous. The cabin hasn’t that upscale feel that can be found at some of the rivals, but despite the dated look and cheap plastics it has a good build quality and a satisfactory ergonomy.